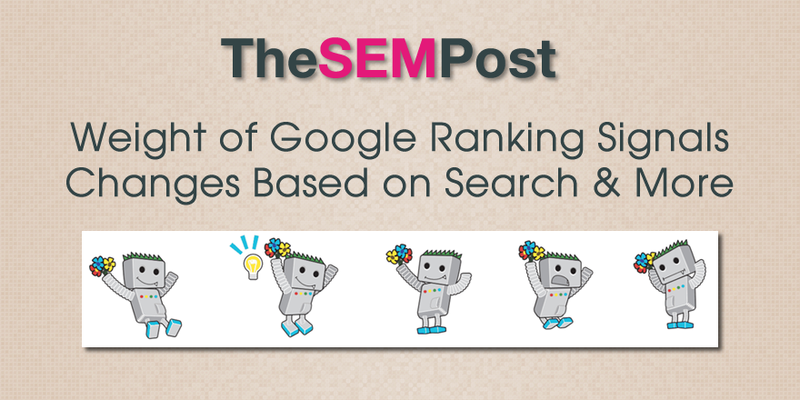 Many SEOs have a fairly good idea of the top ranking signals in the Google search results. Google has confirmed that content and links are two of the most important ranking signals, RankBrain is among the top ranking signals, although it is debated whether it is number three or not. But the weight of Google’s ranking signals can vary based on multiple factors. In other words, Google doesn’t use the identical weight of signals for every single search. I asked Gary Illyes about this yesterday, about how signal weights can change based on things like the query, the searcher and the results. The most obvious one is something that most SEOs might not think specifically about in these terms – the query. If someone is doing a brand name search, yet the company doesn’t actually state that brand name in content on the site, Google will weight other factors much higher than the content. This is especially noticeable on some corporate sites that are fancy in Flash, yet might only have the brand name in a footer or a title tag. For these cases, it makes for the best search results for that brand to be surfaced at the top of the search results, despite the lack of on-page SEO that is present on other sites. For example, the global Coca-Cola website ranks at the top for their name, yet their company name appears on-page only in the footer, and in the HTML in the title tag and meta description tag. If Google weighted content heavily for that brand query, rather than increasing the influence of the other non-content signals, then it would be more likely some of the subsequent results, such as their social pages or news articles, would appear first instead. Location can also be seen as a ranking factor that could vary, based upon whether the searcher seems to be searching for something geotargeted or location specific (“coffee shops near me” or “coffee shops in Kirkland”) versus a query that doesn’t change much based upon location. And language would play a similar role as well – depending on the number of results for something in the language being searched for, the weight of language as a ranking factor could change too. This is also where personalization could play a role. If Google knows I prefer to visit a particular site for information related to a specific topic, it is more likely to surface that site in the search results. Someone else doing the identical search (or in incognito mode) doesn’t necessarily see that same site ranked as high in those results. This all has an impact from a quality of search results perspective. Someone searching for Coca Cola expects to see their site at the top of the results, and if it is not, it is seen as Google having poor quality results since it isn’t showing a poorly optimized brand page first. Likewise, if people are searching for something local, they expect to see geotargeted results.